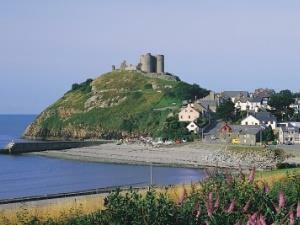 Criccieth TownDominated by its dramatic castle on a headland, jutting out into the sea, Criccieth is a pretty town, with a sandy beach, ideal for families. The castle is unusual in that it is of mixed Welsh and English construction. Built by Llywelyn the Great in 1230, it was later captured by Edward I who built the gatehouse and inner walls. Facilities in the town include tennis courts, bowling greens and a miniature golf course, together with a number of small shops. Dominated by its dramatic castle on a headland, jutting out into the sea, Criccieth is a pretty town, with a sandy beach, ideal for families. The Lloyd George Museum, a few miles away at Llanystumdwy, is at the childhood home of the famous Prime Minister.